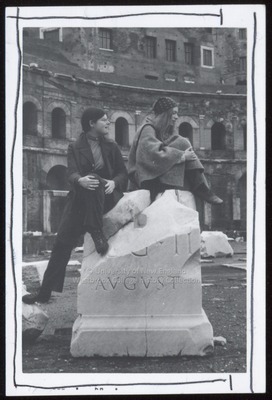 "Two Students in Italy, Westbrook College, 1970s"
Two Westbrook College students perch on top of a piece of marble with, what could be, Roman Colosseum interior ruins behind them, in this 1970s candid black and white photo. One young woman wears dark pants with a dark trench coat over a jersey. The other wears a wool cape or poncho with a three-corner bandana tied pirate-style on her head. Both wear hiking boots or tied walking shoes.